All transactions are safe and secure with a reliable history in online purchasing behind each of our associates. Buy the Superbad Kyle's Killer Lemonade t-shirt to own Superbad clothing and merchandise. 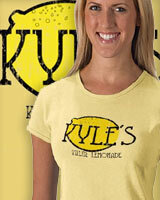 This Kyle's Killer Lemonade t-shirt promotes the beverage that Jule's friend asks Seth to get her. Seth acquires the alcohol with the help of Fogell's fake id, which can also be seen on the Superbad movie poster art. This tee is perfect for anyone who walks around saying things like, "I am McLovin," and "Chicka chicka yeyeah!" For the perfect gift, purchase this with an I am McLovin t-shirt and Superbad poster art. The one-sheet movie poster features Seth and Evan behind the movie logo. In addition to the Superbad Kyle's Killer Lemonade tee above, browse the Superbad Clothing Gallery for more apparel like men's and women's clothes, kids shirts or hoodies.